Dry Creek Crossing, Lincoln Co. Built in 1924, this massive, 120-foot long modified Pratt through span stands between Davenport and the ghost town of Kendrick. The road it is on was once the "King's Highway" which ran between Davenport and Cushing, and was an ancestor to nearby highways 18 and 99. Above, the bridge stands on a high spot in the road, adding to its elegance. 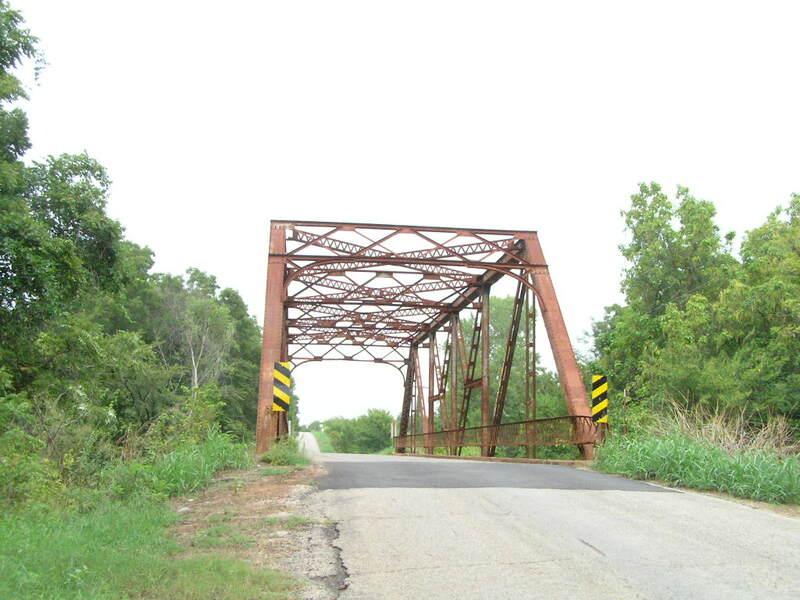 It is a standard OSHC design, though built heavier than normal, indicating the bridge's prominent role in regional traffic. Above, a close-up of the modified Pratt configuration. The nominal struts added to the stiffness to the verticals without making them any larger. Below, the portal as seen from behind. This design of portal is a hallmark of 20's era through spans. Above, this close-up reveals a scar from the bridge's battle with idiot truck drivers. Below, despite the rainy day that I visited, Dry creek did indeed live up to its name. Below, typical upper chord connection. The hill the bridge sits on does add to its imposing appearances, however, it is a slight hazard for local motorists. Other than the clearance damage shown above, all the guards and sides were still straight and true, so we will assume the best.